I went to my first funeral when I was 38. It was my father’s. I hadn’t had to deal with death up to that point – and I haven’t had to deal with it much since then. I’ve paid my respects a couple of times in Japan and South Korea, but I wasn’t particularly close to the people involved, or even knew them at all in some cases. Death was distant; it was abstract. I never felt involved. 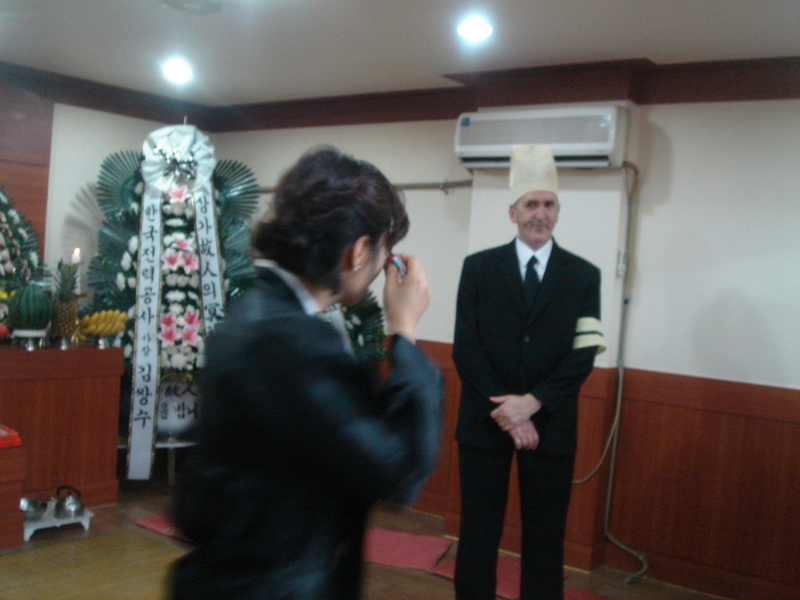 My recent trip to South Korea to take part in my father-in-law’s funeral brought death back into my life. There have been a few deaths sort of near me – all my grandparents. But they, too, were distant. I only met my grandparents once a year at best; I didn’t know them so well. I was 8 years old when my mother’s mother died (at 58) and vaguely remember going to say goodbye to her as she lay dying at home. Her husband died 10 years later, slightly out of his mind, while my father’s mother succumbed to cancer around the same time. I hadn’t seen either of them for ages. They lived far away, I was a teen at boarding school and nobody in my family really seemed to make an effort to meet up. But at 23, with one grandparent left, I made a trek across London to see my remaining grandfather. He was 86, and we went down the pub for some gin and fags. He was good company, alert, funny and as down-to-earth as most Cockneys. He drank pink gin – strong pink gin – and we talked about trivial things. He died a few weeks later. I don’t know how; I don’t know what of. I like to think he had a pink gin in one hand and a Woodbine in the other. But having seen him so recently, I felt connected. I wish I had been more connected to all my grandparents. They were a diverse bunch and had so much to offer. Death continued to pass me by. Working in Saudi Arabia in the early ’80s, a couple of colleagues died young: one through an ill-judged experiment with nitrous-oxide, the other – a rampant homosexual –from a mysterious disease. Life went on. One death while I was there did affect me. In December 1980, I bought the Arab News in downtown Taif and took it home. As I entered my bedroom, I glanced at the front page; John Lennon had been assassinated. I was stunned. Perhaps I was more shocked by the fact that I took it personally. It sounds trite, but it was like a part of me had died that day. But it was true. I had grown up with The Beatles. I had bought Please Please Me at the age of 7. I even went to see the movie Help! with my paternal grandmother, another down-to-earth Londoner. The Beatles wrote the soundtrack to so many young lives. We were all emotionally involved. Fast-forward 22 years to another musician who helped write the soundtrack to my life. Warren was an acquaintance who became a great friend. Like his hero Ray Davies of The Kinks, Warren wrote stories into music – great English pop songs. I used to visit him in Holland when he lived there in the early ’80s. Holland buzzed, and we had a lot of fun. So much fun, it dominated our conversations for the next 20 years. Warren had two Top 10 hits in the U.K. with Bucks Fizz and five minor successes in Japan (I was his agent). He was always first on my list of people to see when I went to the U.K., but with limited time on visits home, I didn’t always see him. At 55, he went to sleep one night and didn’t wake up. It was like being robbed of my memories. 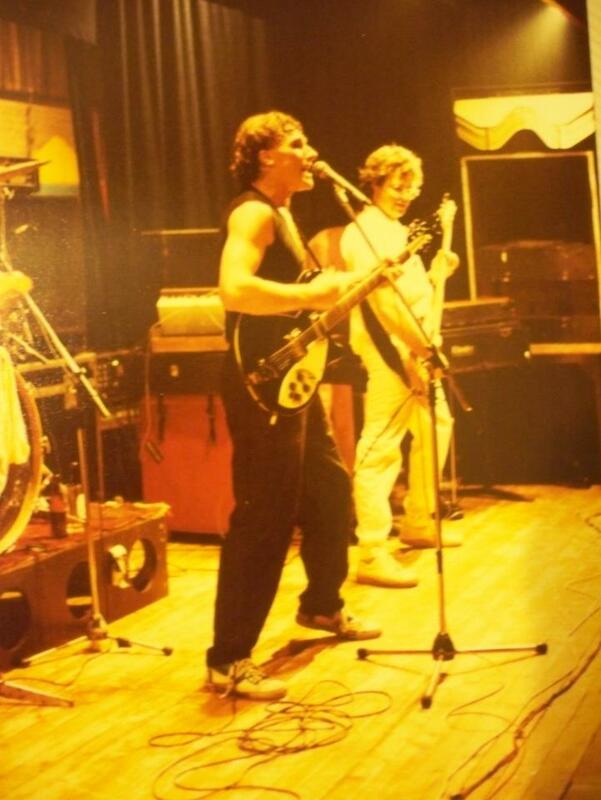 Talking about our rock ‘n’ roll days in Holland kept those days alive, kept us young, kept us alive. Is this what happens? Your friends die and bits of your life just drop off with them? We hadn’t finished reminiscing; that part of our lives still felt so close. Is it now? A week to the day after Warren’s death, I became a father. Suddenly, life had new meaning. My life. But now I realize the enormity of what I’ve done and nothing horrifies me more than to think that I might not be around to help my daughter grow up. I hope I’m wrong, but I don’t expect to live to an old age. My Korean father-in-law didn’t have that problem. One of his daughters died young in a car accident, but he had six reserves plus a son. There was a lot of life in the Lee family. A week after his death, there still is. But saying goodbye to this man – as dignified and well-grounded as my paternal grandfather, who died at exactly the same age, 86 – was a mixture of the grand and the grotesque. And for the first time since I attended my father’s funeral, I was a participant. With my father’s death, the remoteness was still there. My father died while I was in Japan and I’d been living overseas for 14 years. It took me two days to get home. I didn’t have to deal with the everyday stuff of death. I got home and the funeral was arranged. I saw no dead body. I didn’t feel involved. My mother, brother and sister had to deal with everything; I just had to fly home. 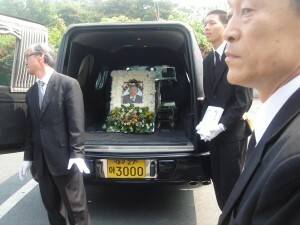 On the morning of the funeral, I played golf. Did I appear cynical? I hope not. Golf clears the head and my head needed clearing. I was hiding behind an emotional wall. It wasn’t going to get to me yet. To get to the crematorium, I drove my rental car. I didn’t want to be part of a procession. I was almost in denial as to all of this being real. But then we were in the crematorium chapel with my father’s coffin on the rollers ready for his final journey to the incinerator. It all came home to me. This was my life. Death was suddenly real. The priest was talking about my father. 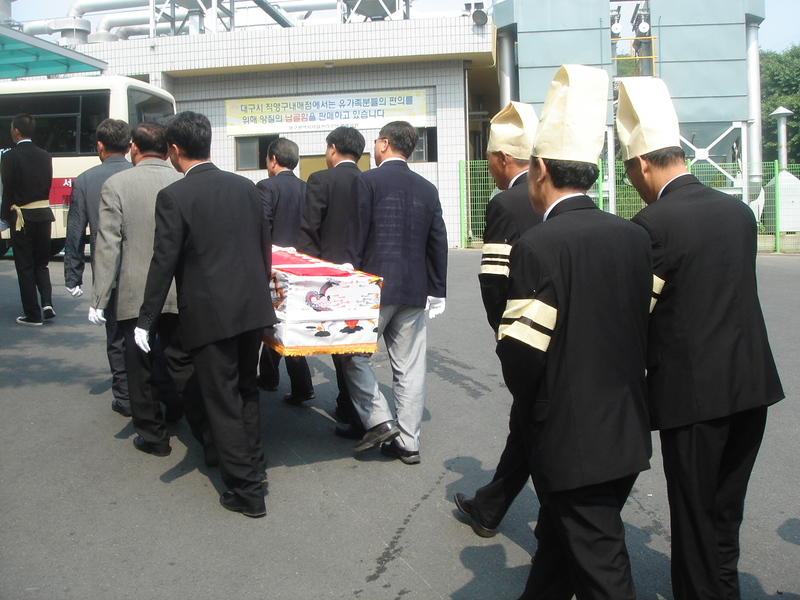 After a short service, a curtain shielded the coffin as it rolled toward the burners. A door closed. Goodbye, Dad. And then we were out in the sunshine, drying our tears, saying goodbye to the living, driving home. What do we do now? Party, of course. Good food, a lot of Champagne and we were living life again. Perhaps it was too easy, too quick. The Koreans have to work a lot harder for their closure. 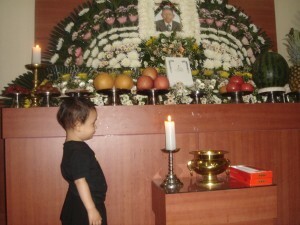 My wife’s father died at around 4 a.m. on a Monday morning. I managed to get my wife on a plane to Busan at 2 p.m. on the same day and she was in Daegu by 6. By then, her family were several hours into the ceremonials. They had delayed dressing the body – in front of the family – until she arrived. I’m not sorry I missed it. Curiously, the first things her parents had shown me the first time I went to their house were the clothes they would be dressed in after they were dead. I was under the impression that I would have to help dress the body. This wasn’t the case, partly because I was traveling a day behind my wife, but mainly because the mortuary staff did that. The wife told me it was done very well and with great class. “My father looked very dignified,” she said. Due to work obligations, I arrived 24 hours behind my wife. I figured that by the time I arrived in the early evening the whole family would soon out of mourning mode and into the food and alcohol. I was hustled into the mourning area in the basement of a small hospital to pay my respects before the altar that had been set up. You could barely move for flowers. I was soon on my knees. “You have to do two and a half bows,” my brother-in-law informed me. Well, what’s that? OK, two on my knees, head touching the floor; I get that. But a half bow? Do I get half up and get down again? Or do I get all the way up and bow halfway. I’ll opt for B, Bob. Eerrrck! Wrong! But no big deal. I was handed a black suit to replace the black suit I was wearing (“It’ll get dirty,” I was told.) and given an oversized white shirt and black tie, identical to the suits and shirts and ties worn by the other five sons-in-law and my wife’s brother. I had to wear a strange tall yellow hat and armband made of linen, which had a single black line running around it. The brother’s had two black lines. 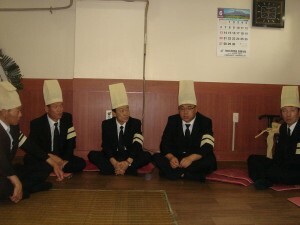 South Korea is a Confucianist country; everyone has their rank. I felt like the corporal of death. In the small altar area, there were seven cushions lined up on each side. Not quite seven brides for seven brothers; there were seven brides for the lone brother and six brothers-in-law. Position was determined by age. I was married to daughter No. 4, so I was fifth in line (the brother was first, of course). The women were lined up in similar order opposite their husbands. The altar had a smallish picture of the deceased and lots of food and flowers. 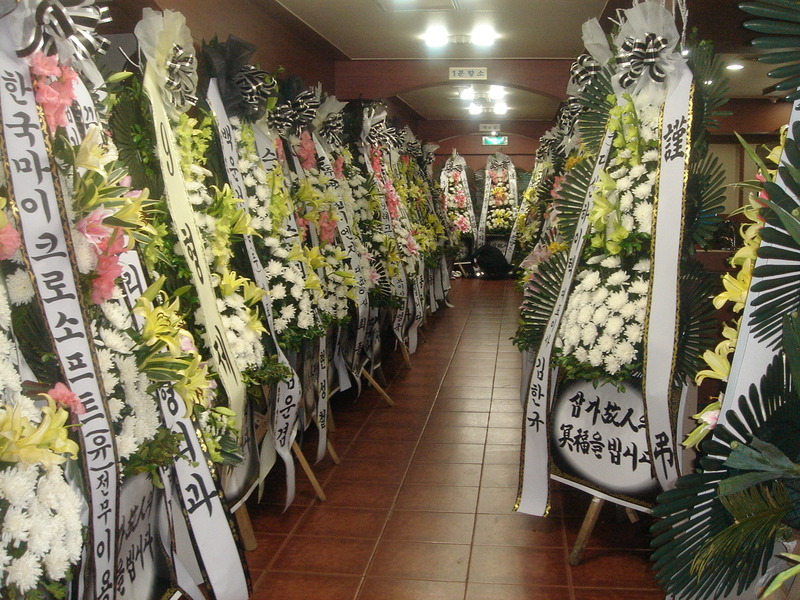 The primary floral tribute had been provided by the chairman of one of South Korea’s chaebols, an impressive tribute and one of significance. Big wheels are turning. Mourners flooded in. 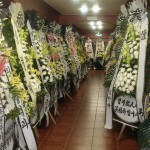 Mourners were not only those who knew the deceased, but also those connected to the family, so colleagues of the son, sons-in-law and daughters. Some came in groups; others individually. 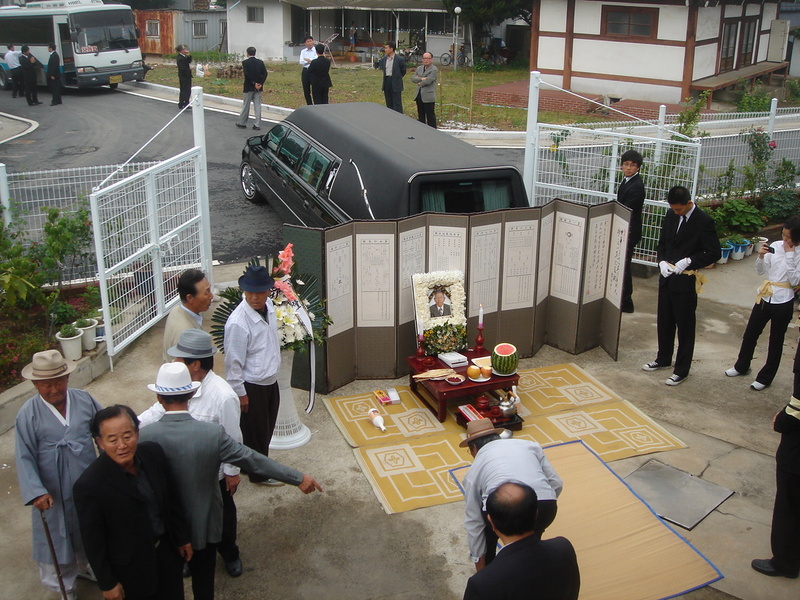 As they entered the mourning area, the family lining each wall would chant “Igo, igo, igo” non-stop, a call to the spirit of the deceased. The chief mourner in the visiting group would make an offering of alcohol and light a stick of incense, followed by the requisite two and a half bows. Then, all the mourners in that group would turn to face the male relatives and both sides would fall to their knees again in a humble bow. Then, they would make to get up, but invariably fall to one knee to offer a message of condolence after being introduced by whoever they knew among the family. They would then put an envelope containing money in a box ($55,000 passed through that box over the three days!). Some would then leave; others would eat and drink at the restaurant adjoining the altar area. They were soon replaced by other mourners. In fact, this had been going on for well over 30 hours by the time I arrived. Nobody had gone home. On the day I arrived, the procession of mourners didn’t finish until after midnight. At 1 a.m., the family ate. Most grabbed two or three hours sleep on the floor. The marathon was not over yet. The first ceremony of the final day came at 5:45 a.m. The ceremonies were now getting more heart-wrenching for the family. 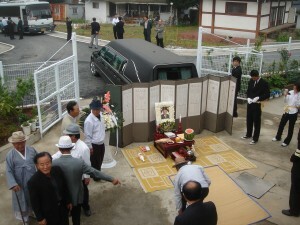 Another ceremony was held in front of the coffin before it was loaded into the massive black Cadillac hearse for a journey to the old man’s home. Another ceremony was held in the yard there with one of the elders from the village leading the prayers. Up to this point, things had been moving and dignified; the old man was being sent off with love and affection. Then we got to the crematorium. 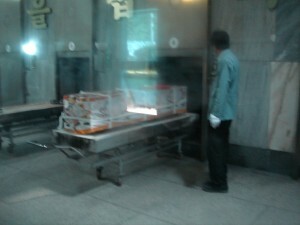 The coffin was unloaded into what appeared to be the tradesman’s entrance. The family was directed to a waiting room. People could watch TV. Soon, we were hustled into a glass-walled viewing room. Beyond the window was the coffin. Beyond the coffin was a line of a dozen doors to what looked like industrial furnaces. It was horribly stark. A door opened and the body was shoved through. It was quick, sudden and shocking. Family members yelped in shock. The furnace door closed and everybody was hustled out to wait. We waited for over an hour under a hot midday sun. We did lunch. We drank beer. We waited some more. I went back to the waiting room as it was cooler there. I noticed a bank of TV monitors, each one placed above a photo of those being “processed.” You could watch the furnace doors open and the ashes being wheeled out on a trolley. The picture was fuzzy, thank God. But then the monitor told us furnace No. 4 was ready and we were hustled back into the glass-walled viewing room. The door opened and a tray of bones was dragged out. The women screamed for their father. Everyone looked on in disbelief. Originally, the family thought they would stick with tradition and bury the old man on a hill near their house. 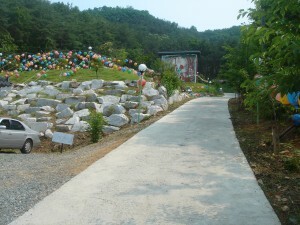 But South Korea is losing its cultural markers. Modern times require quick and easy solutions to life – and death. The dead don’t need to take up space on a hill. One or two bones were still identifiable. Two crematorium staff swept everything into a box and brought it over to where the family were watching in a state of shock. I stood well back, holding my daughter for comfort. Everyone was distraught. This was no way to create a final memory of a man revered by his family. This was processing, not healing, not loving, not even remembering. Who’d want to remember this? The family drove back past the old man’s house and village and up into the hills to a Buddhist temple where his ashes would be enshrined and where the family could find spiritual salvation. Religions require belief and everyone wanted to believe that father was on a journey, and his journey would end peacefully in a sacred place. It was sunny and 33 C; no one had any energy left. A Buddhist priest gave the family the spiritual sustenance they sought. We said our last prayers for the old man’s final journey, bowed to the ground one more time to say goodbye and headed home. Later that night, a magpie – a symbol of good luck in Korea – flew onto a wall of the house. He gave the impression he belonged there and looked paternally at the family members clustered behind an open window. 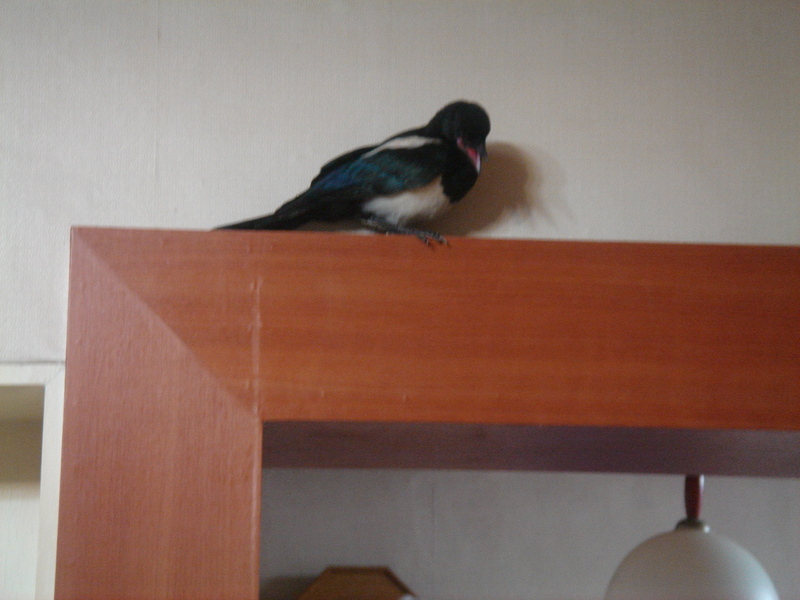 He flew into the house and perched high up in the living room. Nobody said anything, but everyone thought the same thing. How could you think otherwise? After refusing to leave, the fearless widow Lee grabbed the bird and ushered it out. It flew away into the night. She watched it go, saying a final, silent farewell. Sorry, you don’t live here anymore. This entry was posted on Saturday, October 6th, 2012 at 10:33 amand is filed under . You can follow any responses to this entry through the RSS 2.0 feed. You can leave a response, or trackback from your own site.